The final form of transport for many in Dead Man’s Hand. This carriage takes folks from this life to the next via the cemetery. Even death is not enough to keep trouble at bay in these parts and sometimes the final journey itself can be a dangerous one. 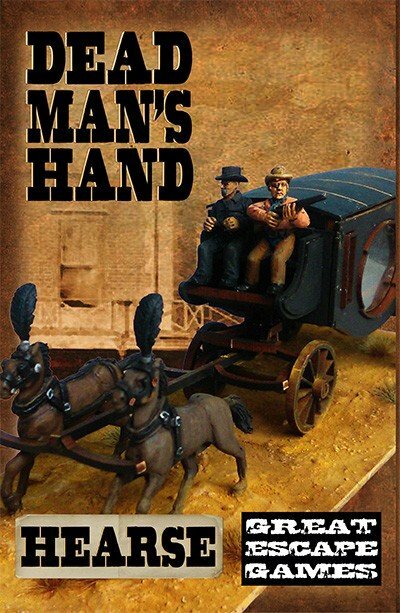 Two special scenes are provided in this box set for use with the hearse.This box set contains 2 horses, driver and shotgun figure and a Hearse. Hearse produced by 4Ground, figures by Great Escape Games and horses from Crusader Miniatures. 28mm scale model. Figures and horses supplied unassembled and unpainted. Hearse supplied fully painted, requires assembly. Base included.